It's a Temperature and humidity data logger , mainly used to record the food, pharmaceuticals, chemi.. It is a Red Blue Display Cigarette Lighter Voltmeter&Thermometer,Input voltage: 12V and 24V Universa.. It is a Red Green LED Cigarette Lighter Voltmeter&Thermometer,Input voltage: 12V and 24V Universal,F.. 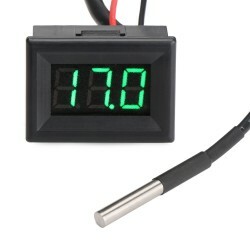 It is a Red/Blue/Green Digital Thermometer,Measuring temperature Range -50 ~ 110 °c,Power Supply DC .. It is a Car Tester Charger, Input Voltage: 12 ~ 24V, Output Voltage: 5V, ±5%, Output Current: Maximu..
Introduction:This digital temperature controller has two kinds of working mode, heating mode and coo..
Introduction:The product adopts industrial grade chip, high-precision SHT20 temperature and humidity..